Get ready for WATCH QUEST! Exclusively for Apple Watch! Get ready for WATCH QUEST! The first adventure game made exclusively for Apple Watch! 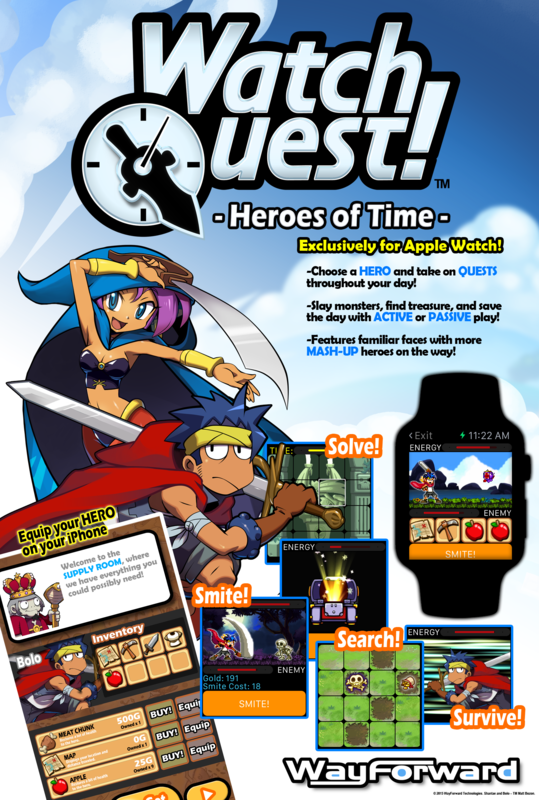 WayForward is pleased to unveil WATCH QUEST! – the first adventure game made exclusively for Apple Watch! Watch Quest is a new kind of game experience that spans two devices. The iPhone serves as the player’s kingdom, while the Apple Watch represents a journey that spans several hours. Gameplay revolves around choosing a hero and equipping them on the iPhone, and then guiding the Hero via the Apple Watch as he or she travels lands, battles monsters, solves puzzles, and searches for treasures. Players are invited to play passively by selecting longer, easier quests and outfitting the hero up front – or by taking on more difficult quests which require foraging for items as you go. The game comes free with one training quest, and follows a DLC model with additional characters and campaigns purchasable from within the iPhone app as Quest Packs. Watch Quest! will share a launch date of 4-24-15 along with the Apple Watch. Has Apple let you as a dev know that customers somewhere will have the apple watch on 4/24? Because being that people can’t just walk in and buy it on the 24th I find it interesting that you’d release your app before you know if anyone will even have the watch on the 24th. With all that said I’m super stoked. Any chance of an Android Wear port? I think it would be great if the game could reach as many people with smartwatches as possible! For to she of you asking for ports to crappy Samsung and Androd devices, (although I would like to see it one the 3DS, would look pretty cool) let me go over the facts from this article that makes me doubt they will port it anywhere. First of all, it’s called Watch Quest!, not just Quest!. ‘Exclusively. Meaning ‘only found in a few areas’ and in this case, that area is the Apple Watch. Also, person above me, $800 for a piece of **** is outrageous, and the cheapest Apple Watch is only $350, $450 for the one that you can actually see. I am more a Android fan over Apple so I don’t think my phone is ****. It was still a little cheaper then the iPhone. Anyway there are such things as time sensitive exclusive games. This can always come out for iwatch first and later to something else. Also even if it is called Watch Quest, that wouldn’t stop them on putting it on a device that isn’t a watch… Even so they can change the name if they wanted to. Game is junk, playing it no, no real information how to play or gain steps and when u reach the steps it resets? Just boring and lacking a lot of features, all u do is stare at a charector running, eventually running into a few things.